Stonehenge in England, the Hunebeddens in Holland and the pyramids of Egypt are known throughout the world. All these ancient stone monuments have survived to the present day. Sochi also has similar antiquities. Dolmens remained an unsolved mystery for scientists for a long time. The theories of how they came to be were very diverse - from ‘dwarf houses’ to ‘energy portals’. Today there is only one answer to this question: they are ancient tombs to bury the dead. There are several complexes of dolmens at Krasnaya Polyana, located in the Beshenka river valley, on the slopes of mount Achishko not far from Krasnaya Polyana. These tombs were built in the third millennium B.C. – the early Bronze Age period. A dolmen complex is the dolmen itself, a stone structure in the shape of a cube with a large square aperture on one side. They also have an area in front of them with a hollow for ritual items as well as menhirs (large upright stones embedded into the Earth). The Sochi dolmens are unique in terms of their diminutive nature. The very small dolmens, which are around ¾ of the height of a human, are found only in the Krasnaya Polyana settlement. In other sites they are much larger, and at times can reach 10 metres in height. The dolmens at Krasnaya Polyana were first discovered in 1911. 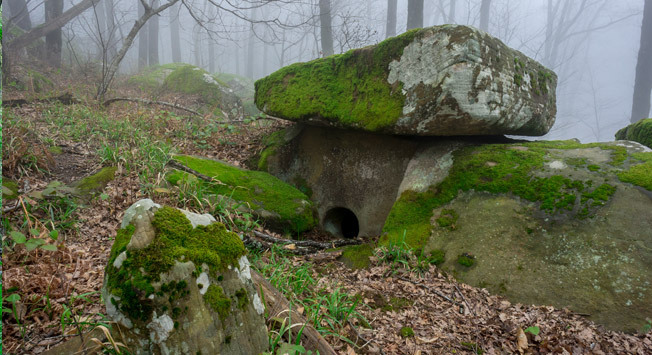 There are to this day unexplored dolmens in Polyana – these are located underground. So-called ‘black diggers’ hunt out these dolmens. Thus, one of six dolmens at Krasnaya Polyana was discovered by black diggers while they were hunting for precious objects that may have been buried in the tomb. Excavations of the dolmens revealed much that was interesting: paste beads (made from a mixture of different materials, similar to clay), clay items and bronze daggers. You can make your own way to these dolmens. They are in open access and anyone can visit this area. You can travel there in an off-road vehicle (the road is mountainous and a normal car would not make it) or you can reach them on foot. This is better as you can walk through the forest and take in the fresh air. It takes about an hour each way to walk there. You have to walk right to the end of Ulitsa Achikhovskaya in the Krasnaya Polyana settlement, find a way through on the map, and then proceed along a back road until you reach the river Beshenki. You then need to climb up and follow the river downstream until you can see the dolmens. The route is also indicated by blue marks on the trees, if you follow these you will not get lost.